I had all these plans this summer, once school (work) ended for a few months, that I would tackle my TBR pile of ARCs and such. I still have plans to do that, but I've also found myself struggling to get out of a major reading slump -- I only finished one book in May! 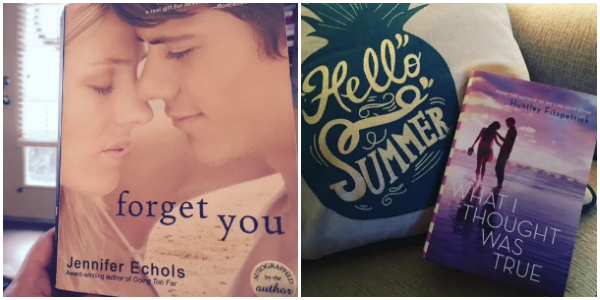 As I started to read those ARCs, or books I've been waiting so patiently to start as the summer began, I found myself losing interest -- WHAT??! How could this be? I've been so excited, SO EAGER to read these! It sort of bummed me out, and actually induced another start of a reading slump. This can not be happening. It's summertime. I am suppose to be READING ALL THE BOOKS. My thoughts exactly. So I started a new plan. A Summer of Re-Reads Plan. And y'all, it is going so fantastic!!! One day I looked at my bookshelf and picked up a book I remember loving so much, but hadn't visited in quite awhile. So I sat down to reacquaint myself, and several hours later (a whole night to be exact) I re-read the entire thing! I thought, wow, that's pretty awesome. So my plan, or spontaneous idea I suppose, is to re-read past loves when the mood strikes. There's no pressure in finishing it by a deadline, or composing thoughts as I read on how I'll articulate a certain scene or theme later in my review. It's just me, my book, and an endless amount of time to lose myself in a story I know I already love. 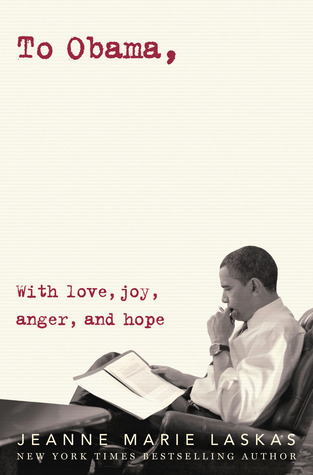 To me, this is what summer reading should be. Looking ahead, my blog turns six in September. SIX YEARS OLD. I feel that I should be making decisions soon -- do I keep at it? or call it quits? But then, I'll read something (in this case a book I already love) and the thought of not sharing those feelings here on GReads feels foreign to me. After all, I began this blog for those reasons alone. So whether I am talking about the latest & greatest new book from such & such publisher, or rehashing past feelings about an old love that I recently read, this place will remain my safe haven. I hope you'll still join me. I don't re-read nearly as much as I would look. It normally ends up being books which are a part of a series I re-read because I am preparing for the release of the next book. I have re-read a few books so far this year, and not just series. I'm trying to re-read a bit of everything when the mood takes me. I think it would be really fun to spend the summer revisiting old favourites. I may try, or just have a month where I choose a number of books I want to re-read. I do re read when I need to. I have a lot of series I started i enjoyed but i am lost in the series and need to continue. i don't remember much. I last reread revenant series by amy plum. I had read the first two then waited way to long for the 3rd book. I really enjoyed the reread. I forgot how much i liked it the first time. I don't do much re-reading. But I'll still read your reviews if you do. I've had to cut down on my reading a lot this summer (building a house) and that means I have less time to read what I want because I'm feeling pressure to review the ARCs I have. I keep telling myself, this is your blog, do what you want! You should too. I am a SERIAL re-reader and always will be. I can't fathom not wanting to return to the words and the characters I love. Most recently, I reread Courtney Milan's UNRAVELED. It's my favorite of her Turner Brothers historical romances and it just never lets me down. I love it so. I don't typically re-read. I always say I want to re-read old favorites, but then the books on my TBR call to me louder. The last time I re-read anything (that I can think of) was when I re-read the entire Harry Potter series last year. But that was after months upon months of telling myself that I should re-read the series, and it still took me nearly a year to get through them all again. I do have a number of other favorites stored in my brain in a "I need to re-read this" list, but I have yet to pick any of them back up. I do re-read but not as often as I'd like to. I struggle with reading lately and struggle even more with my blog. I've mostly been listening to audio books, but haven't written any reviews in months. I'm hoping that will change in the coming weeks once the baby arrives and I get into a new routine. I love to re-read, I feel like I experience the book differently depending on my mood or my age or just catching some little nuance that I didn't notice the previous time I read it. 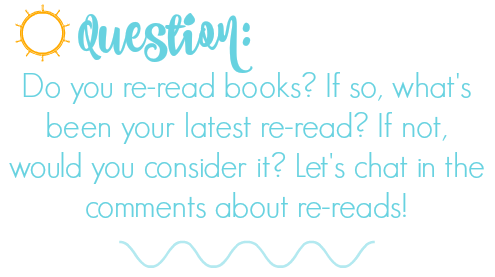 It's funny, actually, because I'd definitely want to reread some of my old favorites BUT I don't do it as often as I'd like to! I think it's always fun to revisit a book that I've loved, and usually, I still feel the same way (if not even more strongly) about the stories in question. I plan on rereading Me Before You soon (! ), both because I would like to revisit it AND I want to read the sequel. I love re-reading Such a Rush by Jennifer Echols and How to Marry a Marquis by Julia Quinn. It's been years since the first time I read those books and re-read them but I still do it and never get bored. I am SO bad at re-reading. There are tons of books I'd like to re-visit, but I'm always like, "well ... how about this book that you've NEVER read before? Shouldn't it get some love too?" I don't really see myself re-reading anything this summer but if I had to choose one book, it'd probably be OPEN ROAD SUMMER by Emery Lord! I loved it so much. I LOVE re-reading books. I actually wish I set aside more time for re-reads. Since I started blogging I do re-read less, which makes me a little sad.